Heavy coolant can be messy, costly, and must be carefully maintained. Disposal costs are a major reason that there is a move to reduce the use of heavy coolant. Dry machining is an alternative and the Nex Flow™ Tool Cooler is an ideal product to use. However, purely dry machining is not always possible due to the need for lubrication or additional cooling that cold air alone cannot provide. In such cases some sort of mist can be provided to supply the lubrication needed. This material can still be a major cost factor. One way to address this is with the patented Frigid-X Sub-Zero Vortex Tool Cooling Mist System. This unique patented low cost system is ideal for these applications to provide both the lubrication needed and cooling. The unit is comprised of a coolant/lubrication suction system which draws any water based liquid into a specially designed delivery system. The vortex tube cools the liquid in the delivery tube to provide a very cold fluid “mist” at around 40 degrees F (5 degrees C). This cooling allows for as much as 20% less coolant/lubricant needed, faster production rates, and improved quality. An Adjusting screw controls the amount of mist required. The simple operation, lack of moving parts except for the adjusting screw means long life, low cost operation, and zero maintenance. This system offers another alternative for cooling when there is not enough compressed air available and if no lubrication is needed, or if the heat is so great that dry machining with air alone is not enough. As long as water mist is tolerable on the part, water can be utilized as the cooling liquid. As cooled water can absorb significantly more heat than cold air, you use less than half the compressed air energy for the machining operation!. The cooler uses only 8 SCFM (227 SLPM) at 50 PSIG (3.1 bar) which is very low. It is very compact and comes with a powerful magnet to attach to the machine and has a flexible hose to direct the cooling onto the part being machined. No other power source is required and there are no costly pumps to maintain. The unit is portable and can easily be moved from one machine to the next as required. Even if you are currently using traditional mist cooling systems, the Frigid-X Sub-Zero Vortex Tool Cooling Mist System will reduce coolant and lubricant up to 20% which can translate into significant savings in material and improve the working environment. The liquid is cooled by means of a small vortex tube that uses around 5 SCFM (142 SLPM) at a maximum of 50 psi (3.5 bar). Pressure can be adjusted up or down slightly to avoid freezing of the liquid or to get a colder temperature. An adjusting screw controls the level of mist required. 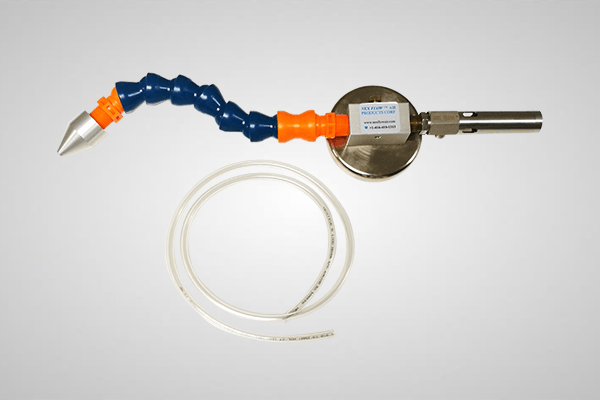 The liquid is siphoned into the unit using a long plastic tube connected to the main unit. A heavy duty removable magnet secures the system onto a machine. The magnet can also be removed and mounting holes may be used to secure the mist system. All you need is the liquid to cool and/or lubricate and a small amount of filtered (clean) compressed air at 50 psi (3.5 bar). No electrical components, no expensive pumps or moving parts except for the adjusting screw assures long life and maintenance-free operation.